nora sportsfloor is an impact-resistant indoor sports floor for school, recreation and multipurpose areas. A rubber floor covering with a matte, anti-slip surface, nora sportsfloor has excellent shock absorption qualities, ball bounce properties and is very durable, according to the manufacturer. nora sportsfloor has a dense surface that is dirt and stain resistant and never needs waxing or sealing. 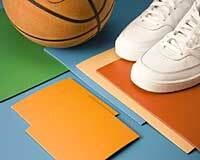 It is also PVC-free with natural fillers and environmentally compatible color pigments.